NOTE: These spherical shock mounts fit "pin" upper shocks (not race-only "eye" conversion) for the front of all C5 Corvettes and all steel framed C6 Corvettes (Grand Sport and Base). These do not fit the aluminum framed C6 Z06 or C6 ZR1 models. This "pin-to-eye" conversion upper shock mount reduces total shock stroke by 2 inches?! 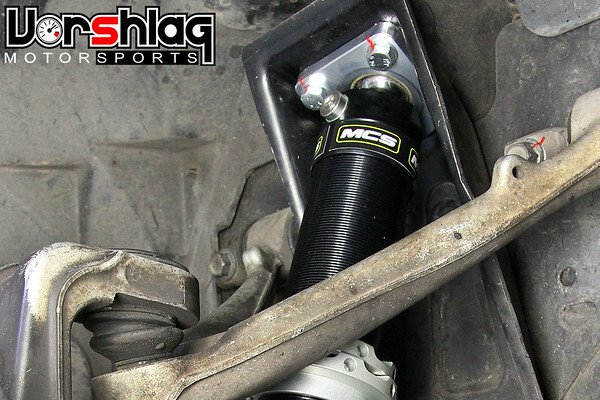 We designed and built our first prototype set of upper shock mounts for the C5/C6 chassis back in 2009 (for an AST install coilover, above), and up front it was an eye-to-eye mount. This is how motorsport shocks were built for these cars back then, even to this day. We realized quickly that this "eye-conversion" mount gobbles up almost 2 inches of shock travel compared to the stock mounting bushing and pin mount. We embarked on a radical design revision in 2015 (see above) and made our production CNC machined shock mount for this chassis shortly after that. The Vorshlag C5/C6 front spherical shock mount not only converts the rubber mount to a spherical bushing, it moves the top of the shock upwards by more than 2 compared to an "eye" style mount, for increased shock stroke. This means a slightly longer shock can be used, for more total damper travel. Win, win! Why not use an OEM rubber bushing? Well the factory rubber upper shock mounts for the C5/C6 chassis are just a big sloppy rubber sandwich bushing. Even when new, rubber shock bushings have to compress and will "slow down" damper reactions to vertical inputs in the suspension. We want the damper to react quickly, not slowly. Rubber also wears out over time, which can create a "thunk" noise. 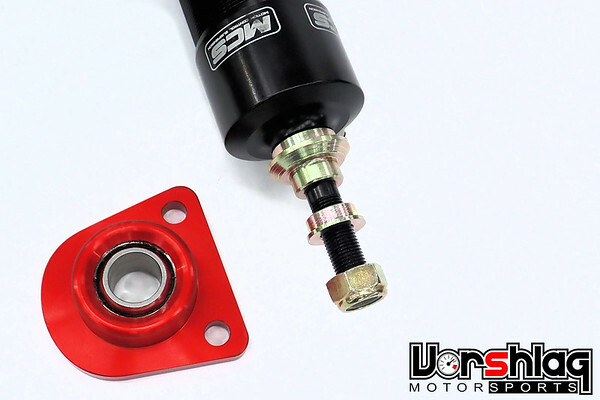 Most aftermarket shocks will require drilling out the OEM 10mm rubber shock mount to fit more common 12mm or 14mm Motorsport shock stems. In stock form, the C5 and C6 Corvette have a (rather soft) transverse spring mounted away from the shock's load path. Of course we want to remove the horse-and-buggy style spring and convert to a coilover shock / spring layout when possible - for many reasons. This conversion moves the main suspension load path from the transverse spring into the damper and these mounts. A metal spherical bearing is much stronger than rubber - so it becomes even more important to convert to spherical shock mounts when you add coilovers. 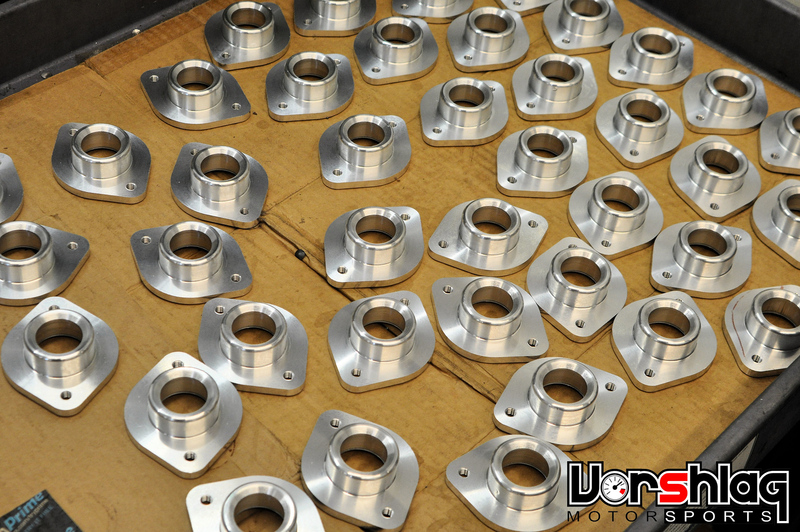 We have made thousands of spherical shock mounts since 2008, for a variety of chassis. 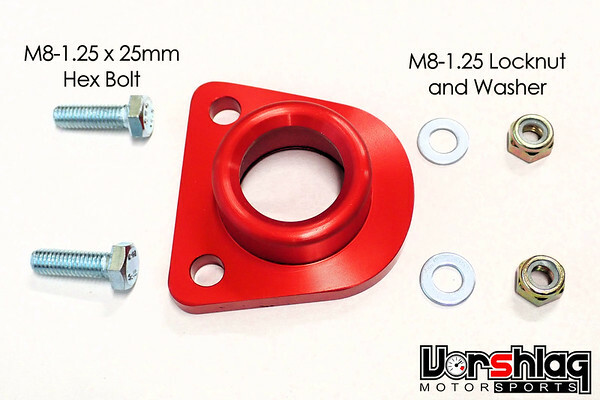 Our aluminum designs feature a massive spherical bearing, are anodized red, and they are strong as a tank. 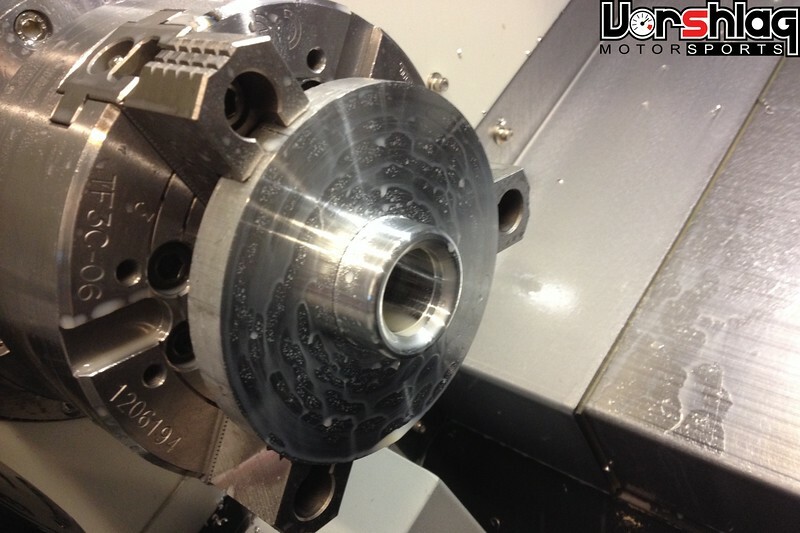 These have been machined in-house here at Vorshlag on our CNC machines starting in June 2015. 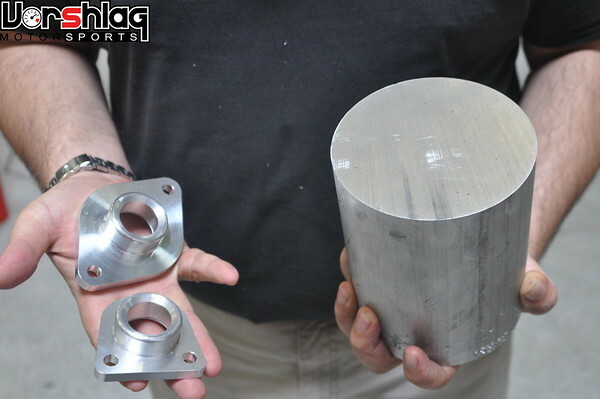 We start with a big hunk of billet (see above left) and after two steps on the CNC lathe and a final step on the CNC mill they are ready for electroplating. Some people are afraid to run spherical mounts on their street or dual purpose cars, mostly from a lack of knowledge. The important part of any spherical mount is that they are sized appropriately, that they fit the shaft they are attached to properly, and they allow "no bind" articulation at the rear shock mounting point. 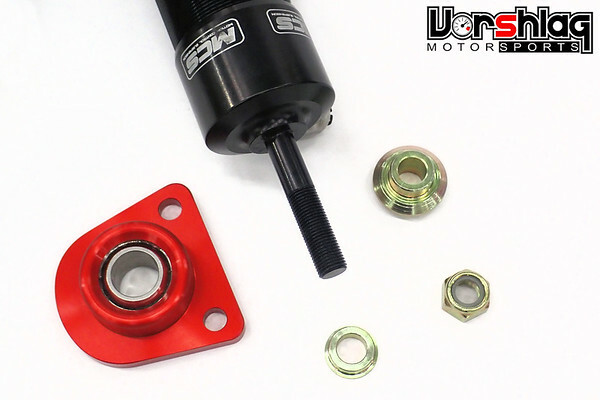 There are three ways to make a rear shock mount for a "pin" style upper shock shaft. The OEM style rubber bushing assembly allows the proper articulation of the shock under suspension movement (it pivots at this mount) but has added deformation that you don't see with a spherical. They can also fail spectacularly. Polyurethane RSMs are too rigid and do not articulate well during suspension movement, causing bind. This bind allows unnecessary flexing of the rear sheet metal where it mounts and makes the car handle poorly. Vorshlag Spherical Shock Mounts do a better job than the other two - a metal spherical ball bearing that smoothly articulates with no bind. The tolerances between the shaft and the spherical bearing are very tight - using custom machined bushings we tailor make for each configuration (see above). Spherical shock mounts are all you see on a race car for good reason, but our design is also applicable to street use - for dual-purpose cars that see some autocross or track time. Vorshlag shock Mounts use the largest spherical bearing on the market (19mm ID) - it is massive, which means it is strong. We use a U.S. made, Teflon lined, aircraft quality stainless spherical ball, stronger than the commercial grade import sphericals used in many competitors' shock mount designs. The spherical bearing location itself has been raised above the shock tower, to increase overall bump travel for your rear shocks. This is a huge advantage to the Vorshlag design, that other mounts just do not do. We have tested this design for 4+ years and they are silent, effective, and have no slop or bind in use. If you somehow manage wear out the massive spherical bearings in these shock mounts, we can rebuild them quickly and cost effectively here at Vorshlag. One key difference on our C5/C6 front shock mount is that we move the spherical bearing above the top of the frame. To do this we have to enlarge the upper shock bushing hole, as well as offset the opening inboard to give more clearance for a coilover spring to the upper control arm. To mount the new spherical mount we also need to add two small mounting bolt holes, for M8 bolts. All of this is visible in the above picture, which has been drilled, had the main hole enlarged, then painted black to prevent rust. 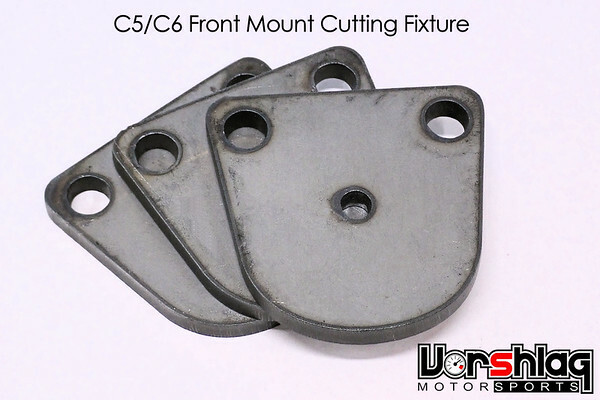 To accomplish all of this we include a front shock mount cutting fixture with every pair of mounts, shown above. 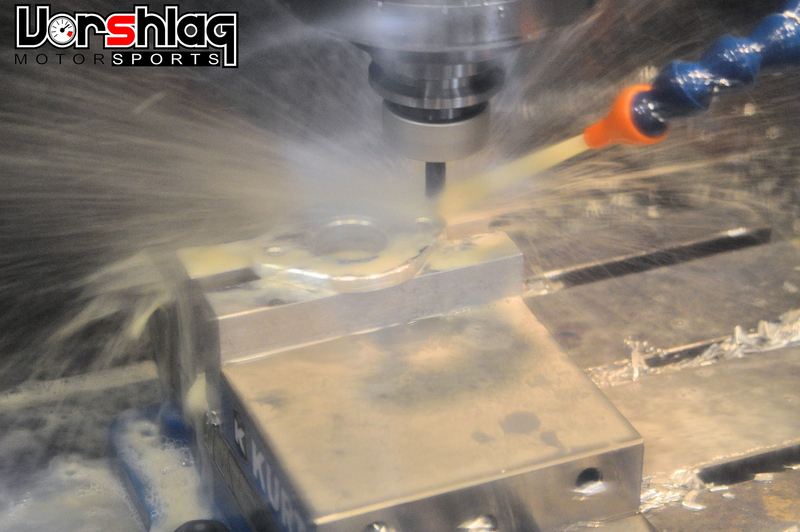 This tool is to used for both sides of the front suspension - first to mark and drill two mounting holes, which are then used to bolt in the cutting fixture. 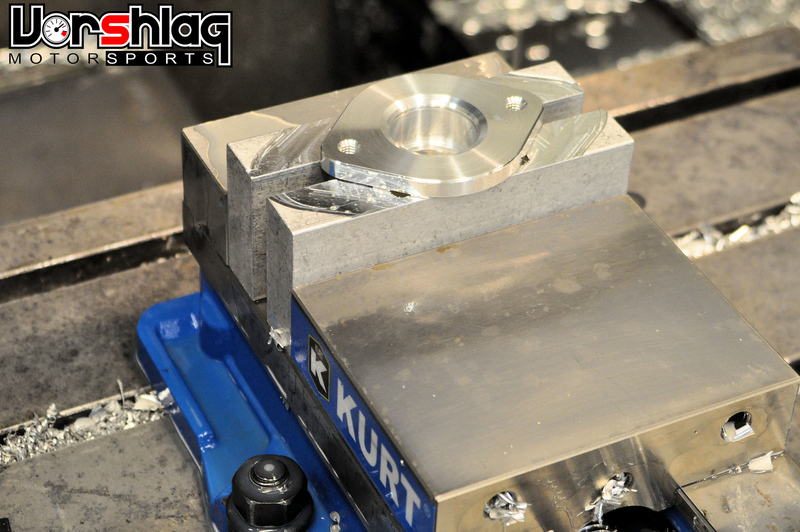 Once the two M8 mounting holes are drilled, this fixture is bolted on top of the shock mounting flange of the frame. This fixture then has an offset 1/4" pilot hole to line up a 1-3/4" hole saw (with a 1/4" pilot bit). This hole saw is then used to cut out the "crescent moon" slugs shown above right. The hole saw can cut slightly into the CNC plasma cut fixture, as it only needs to be used twice (think of this as a "sacrificial tool"). 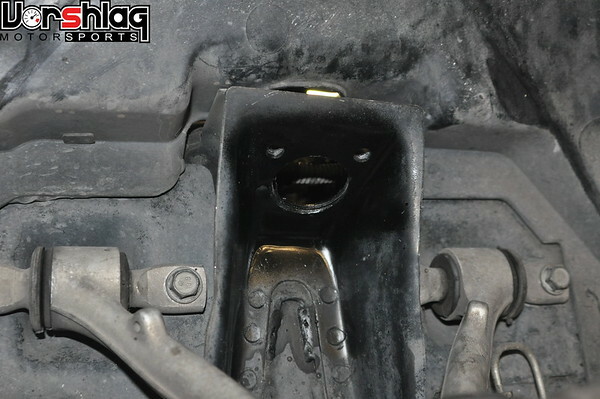 We include new mounting hardware for the front shock mount, as shown above. These bolts are also used to secure the cutting fixture when being used to cut the larger, offset hole thru-hole. The OEM rubber shock mount is not a bolted-in design like the recessed Vorshlag spherical front shock mount. 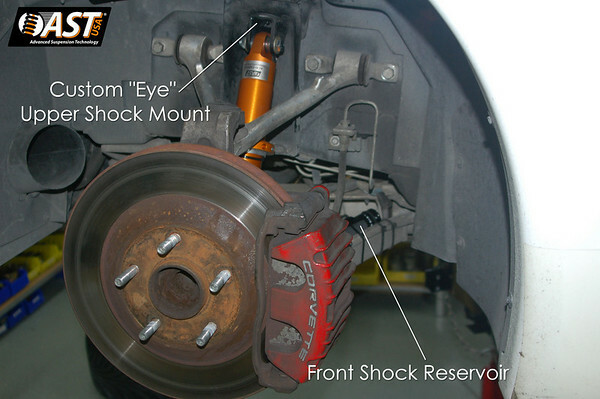 We created this design this way, again, to gain additional shock travel as well as to move the top of the shock inboard a bit to allow the coilover spring perches clear the upper control arm, as seen above. 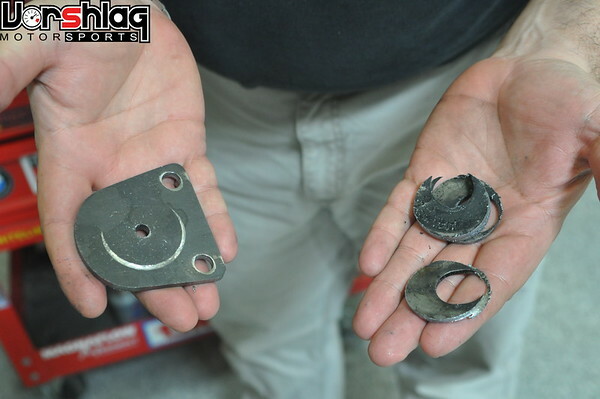 The performance advantage this part gains more than outweighs the additional step of cutting the two mounting holes and enlarging the OEM bushing thru-hole. UPPER STEM DIAMETER: These shock mounts are designed to work with virtually any front shock that had a "pin" style upper shaft and that is made for the C5/C6 models listed. 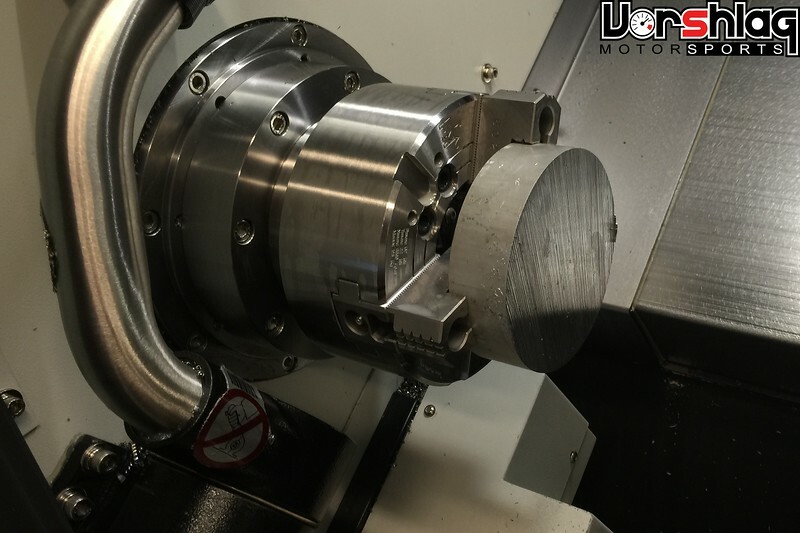 We use different upper and lower bushings (spool pieces) that we machine to adapt the big 19mm ID of our spherical bearing to the smaller shock shaft diameter of the very top of the rear shock. YOU have to tell us how to build your shock mount assembly by picking the proper upper stem diameter of your rear shocks at the drop down menu below. If in doubt, call us. Virtually all shocks made for the C5/C6 chassis use a 14mm, 16mm or 22mm diameter main chrome shaft - we don't care about that part. The part we need to know from you is the very top - these can have a 10mm, 12mm or 14mm threaded upper shaft stem. Typically an OEM or non-adjustable shock has a 10mm upper stem but an adjustable aftermarket shock has a 12mm or 14mm upper shaft diameter (MCS front with 12mm shown above). The shock mount sits on bushings that fit at step where it goes from the big diameter and necks down to the small upper stem diameter. See these images for a better explanation. 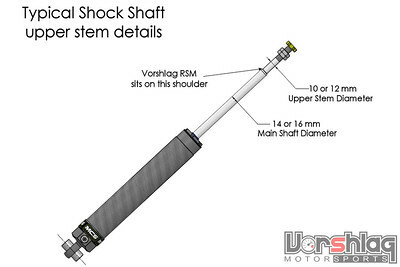 If you are unsure about shock shaft upper stem option to choose, please email or call us. Shipping weight 3.0 pounds. Sold as one pair, for the rear shock location on a C5 or C6 Corvette chassis only.